The Associates of Vietnam Veterans of America's brand is TOGETHER ALWAYS®. 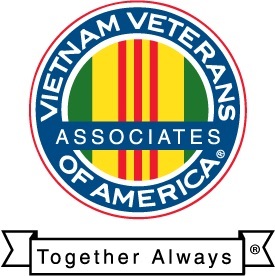 Since the organizational meeting of the Associates of Vietnam Veterans of America (AVVA) in 1999, the brand TOGETHER ALWAYS® has been our tag line to describe the AVVA services and describes our sentiment toward Vietnam Veterans of America, Inc. (VVA). AVVA has always focused our TOGETHER ALWAYS® projects and programs to enhance the lives of all Veteran and their families. We will continue to work alongside VVA and we will support their accomplishments, needs, and efforts as long as the two organizations exist. It is AVVA's intention to carry this brand through to the future, to mean that we will stay TOGETHER ALWAYS® with all Veterans, from all eras, and perpetuate the VVA inspired slogan: Never again will one generation of veterans abandon another. If you need a logo for any public or official use, please send a request to sprice@avva.org, explaining your planned use, and the request will be processed by AVVA officials. Thank you for respecting copyright regulations. Click on the above graphic (jpg image); then right-click and choose 'save image as' to save a copy. You may download a copy of the Agent Orange logo for personal use only. Click on the above graphic; then right-click and choose 'save image as' to save a copy.